Miami Fly Fishing: Snook on Fly. The Snook (local’s pronounce it snooo-k), which is also known as "soap fish" or "line-sider," is an ambush fish. Its engine is a big, flat semi-forked tail that is made for quick acceleration from a dead stop. Its eyes are in the top of its head. Yes, it often feeds looking up. Snook most often reside in mangrove roots, stumps, holes or anywhere there's cover. They are opportunistic feeders - looking for shrimp, crabs, eels or bait fish that swim or are carried by the current. 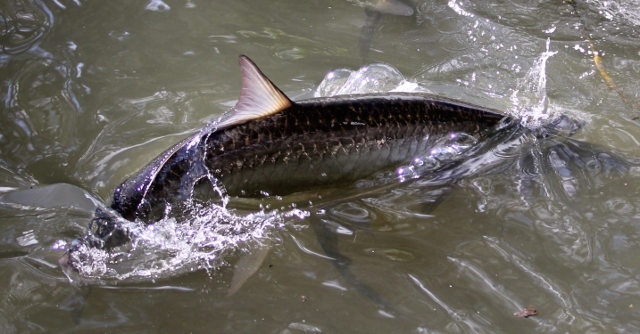 Once its prey comes along the snook inhales its victim like a tarpon by “gill flaring”- sucking water in past its gill plates and capturing prey in its fine villi form teeth. When a snook feeds on the surface the gill flaring creates an easily recognizable ”pop” sound. Snook love strong current and any place they can catch their prey off guard. I fish for them in Everglades National Park mostly by poling the flats looking in potholes, wheel ditches and blind casting the mangrove roots. 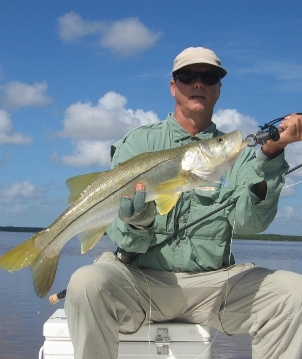 When hooked, a snook will burn the line off the reel and jump and dog the angler. They are extremely hard to spot on the flats; they simply blend with their surroundings. Like Redfish, Snook can be found in Everglades National Park both "out back" in the Everglades backcountry and "out front" in Florida bay. For more information on fly fishing for snook in these two locations, click on the links below.